Andrew Nisker sent me his docu film; “Chemerical” to watch. Andrew was on his way to the Green Planet Blues, International Environment Film Event, in Romania when I caught up with him to get the scoop on his reasons for making the film. 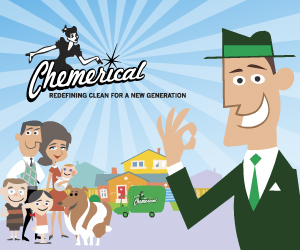 The inspiration for Chemerical came from his own childhood and through having a child of his own. Andrew realised things such as his brand new childhood house with wall to wall carpets, a chlorinated pool in the back yard, a mother that smoked before he was born and a Dad who used to come home with cleaning products (he sold cleaning products to construction sites) might have contributed to the development of his life long asthma. This new awareness convinced him to create a good, clean environment for his son to grow up in. Andrew found fun, effective and economic solutions and proved to himself that non toxic products work just as well as conventional products, they are better for our health, the environment and they save us money. Andrew says, “If you can make a cup of tea, you can make household cleaning products from ingredients such as lemons, baking soda and vinegar” and in Chemerical he challenges an ‘ordinary family’ of two adults and three kids to take on the challenge for 3 months of reducing their dependency on conventional household cleaning and personal care products. The results are startling and speak for themselves; especially when you see the readings from their indoor air quality before and after the experiment. Andrew’s mission is to redefine clean by simply opening windows! Andrew keeps the film light hearted, yet informative. He is clearly passionate about the subject, dedicating 5 years of his life to the research and making of the film, Consequently he so focuses on solutions rather than problems by sharing tools and recipes so that all viewers can be empowered to make the changes to a non toxic life. If you’re inspired to take action yourself after watching the trailer below, you can buy the DVD and host a screening party, join the chemerical nation community , share your experiences on Andrew’s Facebook group or follow his latest news on Twitter. What about you – what conventional products have you swapped for non toxic or even home made recipes?